Have you read about the benefits of cast iron teapots? Maybe you have seen them on display in your local tea shop? It is a topic of debate whether these teapots are worth the price. This article will help explain what is a cast iron teapot, along with arguments for and against their use in brewing tea. To provide a quick overview: cast iron teapots are mainly meant to brew or steep tea, while tea kettles are meant to heat the water. This is why you will see many sites saying not to place your cast iron teapot on the stove (there are a few exceptions). You usually have to find another source for your heated water to pour into the cast iron teapot. Many of these cast iron teapots are handmade in Japan and can be called Tetsubins, although the original Tetsubins were meant for just warming water. Cast iron teapots usually are fully enameled inside and come with a stainless steal infuser basket to place your tea leaves inside for brewing. These teapots often have many different designs, including symbols that have many different meanings. 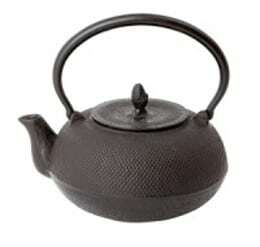 The teapots have various sizes and shapes due to the cast iron being able to be molded into many forms. They also add a nice decoration to your kitchen. Check out the Cast Iron Teapots at Amazon . According to some tea drinkers, cast iron teapots offer the best way to brew tea, due to the cast iron distributing the heat evenly around the pot, which helps to bring out the full flavors and health benefits of the tea. It is also claimed that iron is released into the water giving it better flavor and sweetness, but I believe this only applies if the inside is not enameled. These teapots usually keep your tea hot for at least an hour. The cast iron teapots are almost indestructible due to the strength of the cast iron. They are great for gifts because they might last an entire lifetime. In Japan, it was a custom to pass these teapots on for generations, and you can often find antique cast iron teapots being sold online from $100 to $600. You can also buy a matching cast iron tea set to go along with your teapot. You can buy cast iron tea cups, coasters, an iron warmer, and even a serving tray to display everything. There are other tea drinkers who disagree with the benefits of the cast iron teapots and recommend a pot made of porcelain, ceramic or glass. These people believe that the cast iron teapots are overpriced and meant for tea shops to make money off people who do not know any better. One of their biggest complaints is the enamel on the inside that protects against rust. They claim that tea was never traditionally consumed this way and that the enamel prevents minerals and nutrients from being absorbed into the teapot (I do not think this is a problem for cast iron tea kettles which have no enamel). I have also read that cast iron teapots should only be used for brewing teas requiring high heat such as most black teas and herbal teas, but to avoid brewing lighter and more delicate teas. The verdict is still out whether cast iron teapots are really worth the price, but if you shop around, you can find discounted ones especially online. There is a wide variety offered at Amazon. Check them out here . So, is using a small tea kettle for brewing tea a good choice? I mean use a small tea kettle as a teapot. Is rust issue going to be serious?